We get calls about moving my house to another lot quite often. Even more common is the one where a couple finds out about a free or really cheap older home in or near the downtown of one of our local OH cities. The hope with these calls is that for an economical price they can move the house to a more desirable lot in the location that better suits their needs. Let take few moments and look at just how possible this may be. First is moving my house worth doing in the first place no matter the distance. The rule of thumb is that if the house is pretty much live-in-able as it sits than yes it is probably worth moving. In other words, if the house is in need of paint, carpet, and some other sprucing up that is probably okay. If the house is in need of a major whole house remodel than no it probably will not make sense. By the time you add the cost of the move and other related costs to the remodeling, you may very well be above the price of comparable house prices in the area. Second is the route to the new lot. How many obstructions are on the way along the way of moving my house? The moving equipment will add about 4 1/2′ to 5 1/2′ to the hights of the house as measured from the top of the foundation to the peak. Wires are often at 18′. So are lights and signs and tree limbs and on and on. Bridge overpasses are often lower than that. 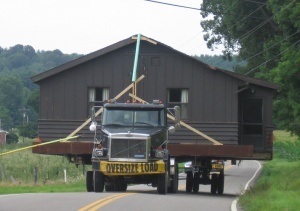 If you are wanting to move a two story house it may go down the road at over 30′ tall. Even a one story can be over 18′. In OH it is the house movers responsibility to pay for the moving of any and all obstructions. Unfortunately, this can be tens of thousands of dollars. The best way to know for sure if your project is going to be feasible or not is to contact us. If it is a nice house and there is not much in the way it may very well be a good one. Let’s figure it out together. ← Why would I build a new basement under my existing house?